MEMBER MEETING WALPOLE & MEISTERKREIS | Meisterkreis – Deutschland e.V. October 3–4, 2017: London. 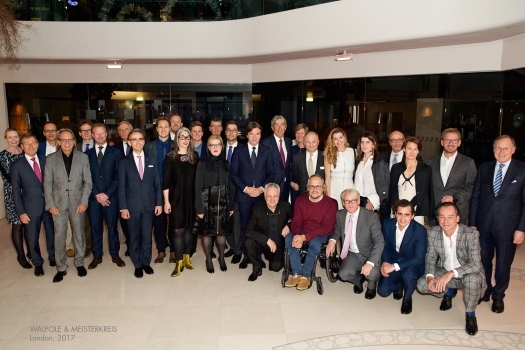 At the beginning of October, the Meisterkreis visited its English counterpart Walpole in London, accompanied by over thirty of its member CEOs, including Walter Knoll, Loewe Technologies, Leica, Nymphenburg, and Esteé Lauder to name a few. The meeting kicked off with the “Culture, Craftsmanship and Curiosity Dinner” in the Design Centre Chelsea Harbour with keynote speaker Dr. Tristram Hunt, Director of the Victoria and Albert Museum. “Our relationships with our colleagues in Germany and our colleagues in the ECCIA are long-standing. They are relationships that are founded on common interest, mutual benefit and, importantly, respect and admiration between business leaders and peers. It is with this spirit that we look forward to many years of future collaboration.” Michael Ward, Charmain, Walpole and MD, Harrods.